DURUM provides high performance welding and surfacing wires and powders. DURUM is a global market leader in the supply of specialized overlaying consumables that can be applied by a range of processes including: Flux Cored Wire, Plasma Transferred Arc (PTA) Welding, Laser Powder and Wire Welding, Oxy-fuel Welding, Thermal Spray Powder and Wire without using "conflict" materials. DURUM focuses on “continuous development” and sets a significant annual budget aside for research and development including new product development, product enhancement and the development of highly specialised solutions to the most challenging applications in the industry. 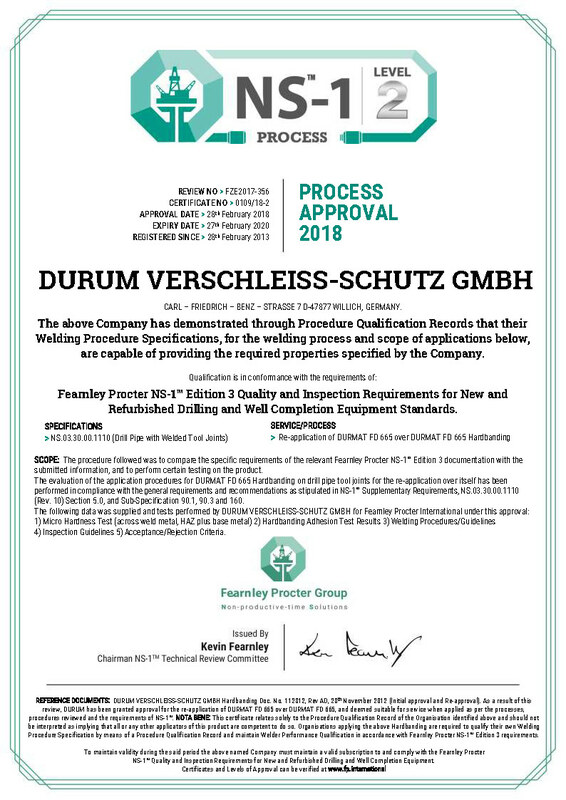 DURUM VERSCHLEISS-SCHUTZ GMBH was established as a manufacturer of advanced materials for wear protection in Mettmann near Düsseldorf in 1984. For more than 30 years, DURUM has been dealing with development and manufacture of materials for application welding ad thermal spraying to protct parts from war and corrosion. Today DURUM has production and service centres in Willich / Germany (headquarter) Brazil, France and the USA. The company sells its products in more than 80 countries around the world! 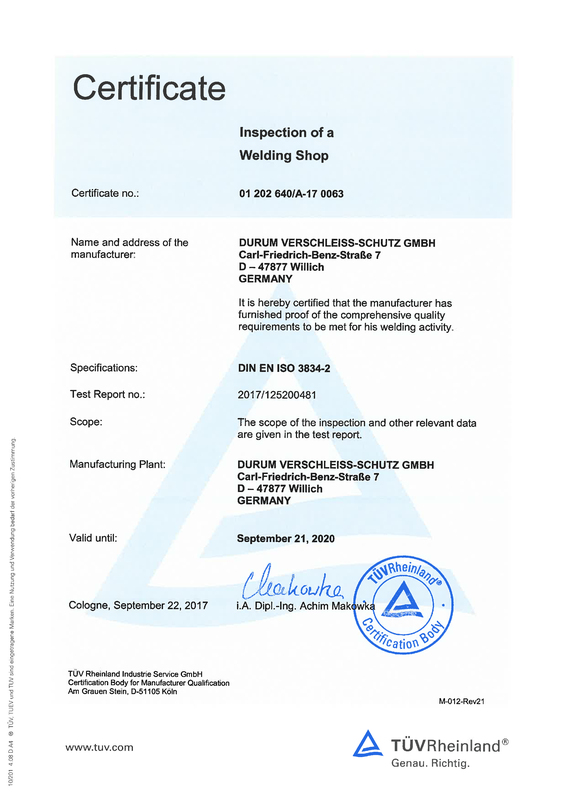 DURUM VERSCHLEISS-SCHUTZ GMBH is certified according to DIN EN ISO 9001:2015 and DIN EN ISO 3834-2. Furthermore DURUM has got the Fearnley Procter NS-1 ceritification. Fearnley Procter Group is an independent organization offering quality assurance/quality control services for well operations in the oil and gas industry. The group offers very specialized services based around the reduction of non-productive time during drilling and completion of oil and gas developments known as the company. The NS system covers QA/QC Inspection Services, Well Engineering, Process Assurance, Training and the company library of NS Standards and Booklets. 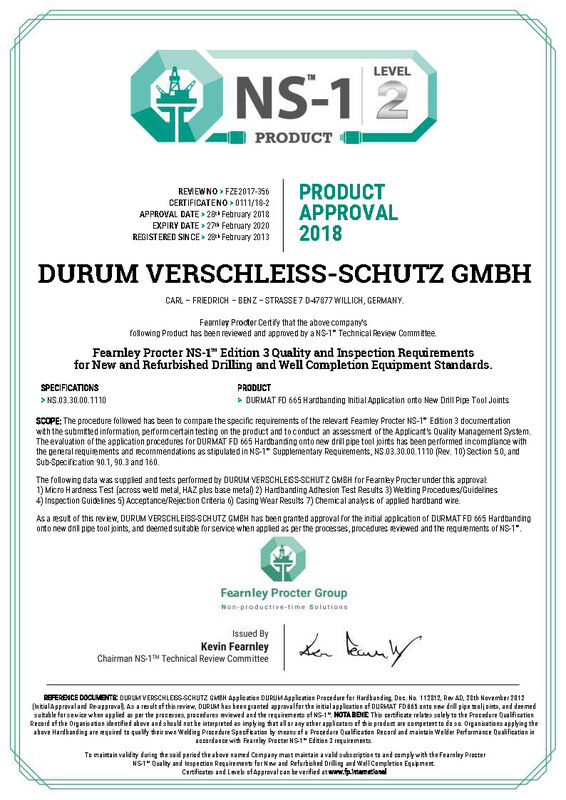 Certified products have been reviewed and qualifi ed by selected members of the Fearnley Procter Technical Review Committee which consists of industry experts including users, manufacturers and consultants of drilling and well completion equipment. 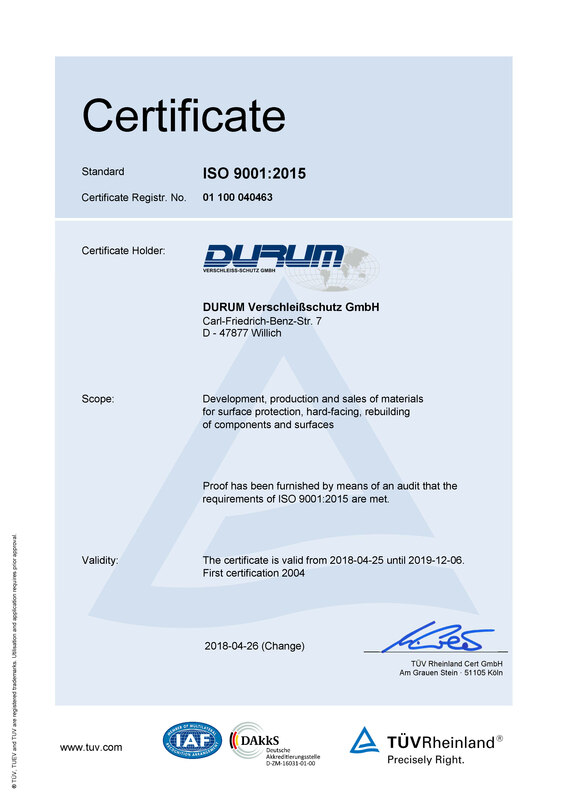 DURUM stands for the promise that we function as a technology partner in wear protection for our customers. We understand the complete range from the raw material to the perfect customer solution. As a material producer we have direct control over our production processes and can ensure optimal material quality due to our high internal quality and production process standards. Our headquarter bundles material production, customer service, technical department, research & development and sales. This enables us to have a reliable communication structure and short reaction times while maintaining a high level process knowledge. Our bundled company structure provides a direct benefit for all our customers. Additionally we can realize individual customer solutions as our technical department has access to a fully equipped metallography lab. A R&D-Welding lab and a thermal spray booth. We develop new materials and work on continuous improvement of existing products. Together with our customers we are able to find the perfect material or technical solution for most types of wear problem in the field. DURUM has the right answers for most problems. Contact us now.